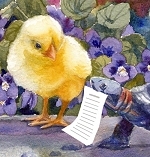 Get a peek at new original paintings, prints and other chickie things before they are released. Just fill in the secure form below. We'll make sure to let you know!